Skin problems can affect a dog's health, and mar his beauty. Fortunately, the Great Pyrenees isn't prone to many skin and coat conditions. While your big, white dog can suffer from skin problems common to any canine -- such as flea allergies -- sebaceous adenitis is the only hereditary dermatological issue found in the breed. Sebaceous adenitis results in skin gland inflammation, with symptoms including hair loss, scratching, foul odor and excess dandruff. Lesions might occur on severely affected dogs, with possible secondary infections. Seek veterinary care if your dog is experiencing these symptoms. Your vet might recommend antibacterial shampoos and antidandruff products to treat the condition, along with antibiotics for skin infections. As he ages, he might develop a benign tumor of the sweat glands known as an apocrine gland adenoma. 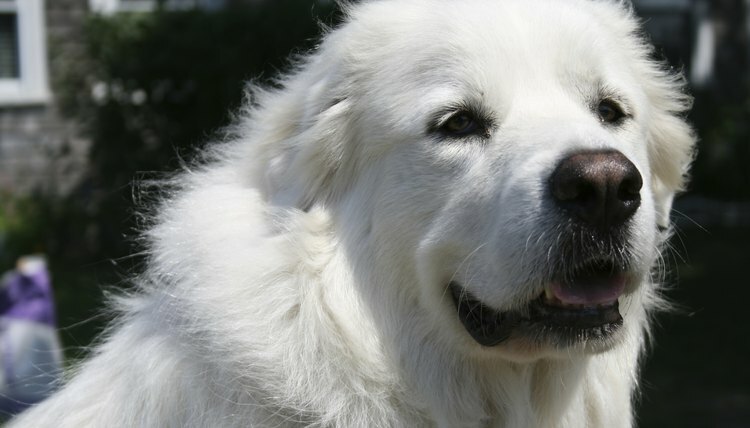 If you discover a small, fluid-filled lump on your aging Great Pyrenees, it's possible that it's an apocrine gland adenoma. These growths generally appear on the legs, head or neck. Even though these lumps are primarily cosmetic, you should have any growth on your pet checked by your vet. If it's an apocrine gland adenoma, surgical removal is curative.